Lacrosse ball massage is effective to relieve muscle pain. These balls are specifically good for the treatment of pain in the hips, buttocks, and shoulders. They also work great in managing the muscle soreness in calves, biceps and triceps. The small size of the balls can allow users to easily find the trigger points and give the targeted massage. Try the following moves to massage with lacrosse balls. Pain in the gluteal area is common, causing discomfort in the lower back and thighs as well. Stand with your back against the wall and place the massage ball between you and the wall. Start to move slowly until you find a tender spot. Once you have discovered the tender spot, relax your weight on the wall and let the ball apply pressure on the painful area. Tight hamstrings are common nowadays due to prolonged sitting. 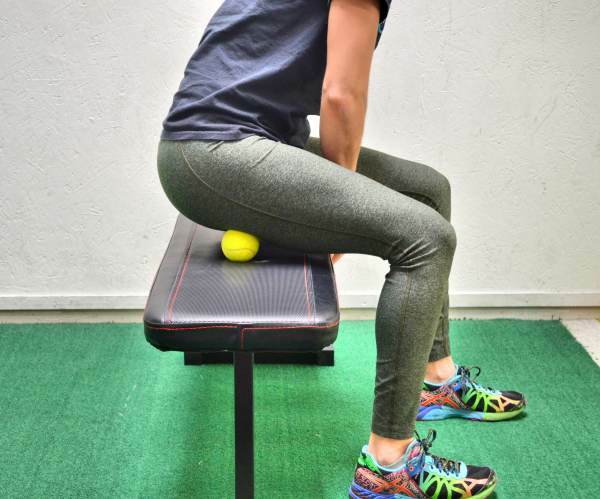 Sit on a chair or table and place the lacrosse massage ball under your thigh. Make sure to move slowly until you locate the painful area on your thigh. Once you have discovered the spot, lean forward and rest your arm on your thigh. Extend and bend your knee slowly for about 30 seconds as the weight of your body rests on your thigh. Upper back pain, shoulder pain and neck pain are very common worldwide. Lacrosse ball massage is perfect when trying to relieve this pain due to stress or muscle overuse. Make sure to stand with the back against the wall and place the ball between you and the wall. Position the ball correctly on your upper back and start moving slowly back and forth in order to find the tender spot. Cross your hands over the chest and relax the weight into the wall. Contine to move up and down to massage all the tender spots. Pain in the chest usually results from bad posture or any other health conditions affecting the neck and upper back. Make sure to face an edge of the wall. Place the lacrosse ball close to your armpit on the chest muscles. Lean forward toward the ball and make sure to move back and forth, rolling the ball slowly on the chest and shoulder area. Move slowly even in circles and gently massage the painful area. Slide your arms up and down on the wall for support. Lacrosse ball massage is recommended in cases diagnosed with plantar fasciitis. Plantar fasciitis is a medical condition characterized by pain in the bottom of the foot, resulting from an inflamed and irritated plantar fascia. Make sure to place the lacrosse ball on the floor and place your foot over it. The ball should be placed under the arch of your feet. Once the ball is in its right position, lean forward, by putting weight on the foot, slowly rolling the ball back and forth along the foot arch. Continue the massage for about 60 seconds. Normally, as we all spend most of our time in front of the computers, our forearms are strained. If the forearms are not properly stretched and strong enough, the carpal tunnel syndrome develops. Place the ball on a flat surface like on a table for example and rest your forearms on it. Move your arm constantly, and as you move it the ball will roll up and down putting pressure on the painful areas. It is recommended to repeat this type of massage several times during a day in order to relieve the forearm muscles. Runners mostly have calf problems as their calf tends to be very tight, even leading to Achilles tendinitis. 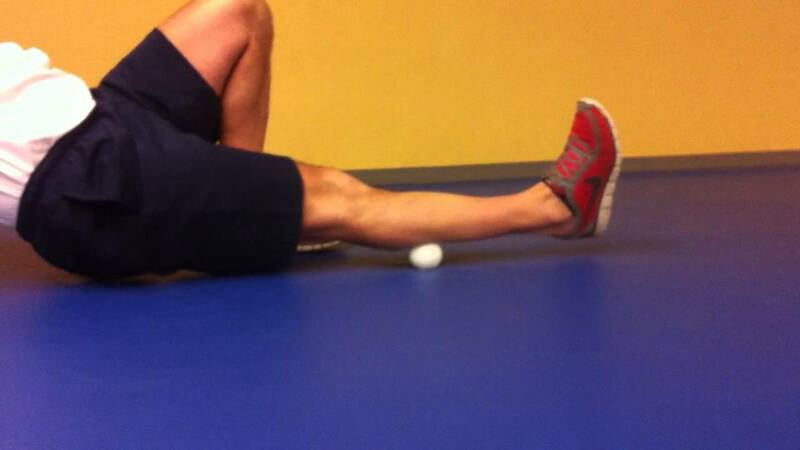 In order to massage your calf area, you need to place the lacrosse ball underneath the knee. While moving the calf up and down, the ball will roll up and down the calf too. Massage of your calf should be repeated a couple of times during a week. Besides lacrosse ball massage, there are also other balls suitable for massage. Choosing the right ball for massage is not that easy. In order to choose the right massage ball, you need to pay extra attention to the size, shape, weight, and hardness of the ball. The size of the ball used for massage should be chosen based on the part of the body that needs massaging. When working on the chest and shoulders, a ball with the diameter of about 100mm is necessary. When working on the abdomen, upper and lower back part, hamstrings or calves, the ball should be lacrosse ball, tennis ball and baseball, respectively with the sizes of about 63mm, 67mm and 73mm. When working on the hands, feet or forearms, the size of the lacrosse ball is great. Heavier balls are more likely to stay in their place just where you put them when compared to lighter balls. Solid balls are heavier than hollow balls. The shape of the ball is very important when performing massage. Smooth and round balls will help you control the movements better while rolling on it. However, when you sweat from the massage, the balls with bumps can improve the grip. It is hard to find a ball with the perfect hardness that will work for every body part. Normally, each part of the body will respond differently to different ball hardness. Over the time, as the flexibility of your tissues improve, you will need to use harder balls for massage. In cases of any injuries, softer balls are recommended.